With home improvement projects being costly and time consuming, it’s easy to put off replacement home windows until completely necessary. But how do you know when it’s time to replace them? In this blog post, we’ll explain when it’s best to take the plunge and replace those old, leaky windows. You hear a lot of outside noise. If your windows provide little protection from the sounds of the outdoors, they may not be sealed correctly or were poorly made to begin with. New double- or triple-pane glass windows insulated with Argon or Krypton gas can decrease outdoor noise, which is especially helpful if you live in a busy neighborhood or on a busy road. You feel a draft, even when your windows are closed. Do you feel a breeze from your windows when they’re closed? If so, there could be a number of issues including poor installation, faulty seals and more. A drafty window can drastically change the overall temperature of your home, causing your HVAC system to work twice as hard to keep up with the fluctuating temperature. Window frames are soft, chipped or water damaged. If your window frames are soft to the touch and chipped, it is likely that they are already beyond repair. Soft window frames indicate rot and water infiltration. It’s possible that they will start sagging, if they haven’t already. Difficulty opening, closing and locking windows. Windows that were not installed correctly tend to develop balance issues, making the windows challenging to open and close. Windows that are rusting or rotting can also be difficult to use. If your windows do not close properly, you may not be able to lock them, which can impact the safety of your home. Condensation build up between glass layers or cracked window glass. If you notice that your windows are frosting between the layers of glass, it means that your seals have failed, allowing moisture between the glass panes. Once the seals fail, any insulating gas used to make the window energy efficient is now gone. Cracked window glass allows additional spots for air to leak in and out of your window. What’s the Importance of Replacing Failing Windows? If it seems like your energy bill increases each month, it’s very likely that your windows are not functioning as they should. Replacing the windows in your home with energy-efficient replacement windows can help lower your heating and cooling costs, which will save you money each month. 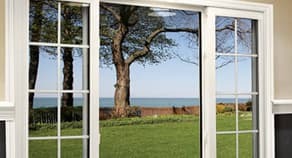 Stanek® Windows offers multiple energy-efficient glass options that save you money on your energy bills and block UV rays up to 99 percent more effectively than ordinary glass. When choosing a replacement window company, it’s important to ask the right questions. Do the windows meet ENERGY STAR® requirements? Do the windows come with a warranty? Replacement windows should last a lifetime, so make sure to choose a company based on the quality of their products, not just the sticker price. Stanek offers affordable windows that meet all ENERGY STAR® requirements and are structurally reinforced, promising long-term use. Each of our vinyl replacement windows is virtually maintenance-free, meaning you will never have to sand, paint, stain or refinish your windows. Stanek replacement windows are also available in a variety of interior colors to match the style of your home. You can enjoy the look of wood windows without the maintenance with our interior woodgrain finishes in four different shades: light oak, medium oak, cherry and walnut. We offer unlimited custom exterior colors to perfectly match the exterior color of your home. At Stanek Windows, we also offer a variety of hardware finishes and designer glass options, which allow you to personalize your windows and match the aesthetics of your home. At Stanek Windows, we understand that replacing your windows is a big investment; that’s why we provide you with endless ways to make your windows as unique as your home. Are you ready to replace the windows in your home? 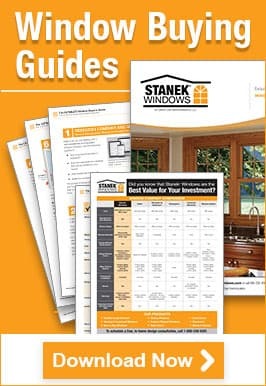 Have your questions answered by scheduling a free, in-home estimate with one of our Stanek Windows experts, or by giving us a call at 800-230-8301.